auxiliary testing process for the assessment of disparites in the properties of textile fabrics, which is applied in their evaluation. Is performed by the touch of the hand on the surface of the textile fabric. Used to establish disparites in properties, namely stiffness, softness, sharpness, and the effect of the blend and texture of the surface on the skin of the fingers. 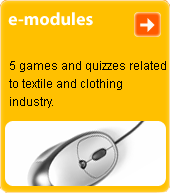 T. is dependent on raw material, weave, pick, yarn, finish, and the general structure of a textile fabric.